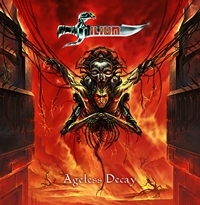 Ilium is a melodic power metal band with roots strong in the classic heavy metal sound as played by the likes of Iron Maiden, Black Sabbath, Dio and Judas Priest. The Australian band also adds the more modern approach of bands such as Masterplan and nowadays power metal combo's. New on this album is Mike Dimeo (vocals). On the band's third release 'Vespertillion' Lord Tim was still behind the microphone. In fact Ilium is a project of Jason Hodges (guitar) and Adam Smith (guitar, bass, keys). This time they invited also Mike to do the vocals. Tim Yatras fills in again the place behind the drums. Mike is known as vocalist for Riot before succeeding Jorn Lande as the lead vocalist of Roland Grapow's project Masterplan. With Mike they have again a perfect and talented vocalist with soul (a kind of mix between Jorn Lande and David Coverdale) and that's a big advantage in the power metal genre. Musically there is nothing wrong with this fourth release; with great hooks, nice melodies and a good balance between faster and more mid-tempo parts the songs stay interesting. Tommy Hansen's production is as we can expect from this first class producer. One of the best songs is "Nubia Awakes" a song that has everything a good song should have. A great melody, good keyboard lines and powerful vocals. Sometimes the keyboards sound a little simple like on the fast song "Ageless Decay" and in the last track "Idolatry", but that isn't irritating. Weakest song is in my opinion "The Little Witch of Madagascar", but maybe that's just because of the simple refrain. The band knows how to combine different styles into good songs, never sounds very original, but who cares? Fans of Masterplan, Black Sabbath, Dio and power metal fans that like more soul in their music instead of just happy metal should have a lot of pleasure with this album.